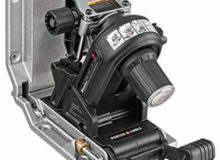 The following articles intend to inform various methods to sharpen a tool to obtain a good cutting edge on the most common tools used by the average woodworker. 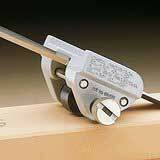 All woodworking tools need to be kept sharp to get the best results. 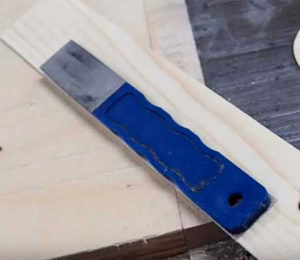 This method is ideal to introduce anyone who is beginning to start using woodworking chisels ad doesn’t want to invest in expensive tool sharpening equipment. 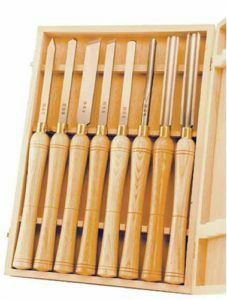 But wishes to get the best use of the chisels, this description is to give a guide to a method that will give good results for sharpening hand tools. At first check the flatness of the back of the chisel with a strait edge, it preferably should be slightly hollow. If it it is a new chisel remove any protective coating that the manufacturer has put on to prevent rusting. A selection of wet/dry Emery paper from about 200 grit to very fine about 2500 grit. A perfectly flat surface to fix the Emery paper on, such as a piece of plate glass or a disused marble top. Affix the Emery paper onto the fat surface either by adhesive or Masking tape. 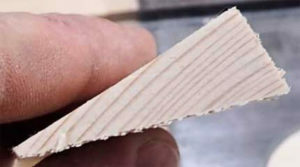 Affix the paper grit to the flat surface so they are starting in line from the coarse grit followed by the next grit and finally ending with the finest grit. A good flat surface can be plate glass or a marble top, use masking or double sided sticky tape. Then place the flat side of the chisel on the course grit and using a circular motion grind the back of the chisel. It is not necessary to grind the complete back just the first few inches from the cutting edge. 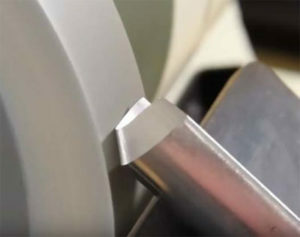 After a few circular turns lift the chisel off the abrasive paper, be careful to lift the cutting edge off fist to ensure no inadvertent damage to it. Wipe the area to see the area that has been ground, the area has to be from edge to edge and at about 2 inches from the tip. Once that is achieved continue grinding but gradually using finer grits until there is a mirror like finish. Next face to polish is the bevel, if the bevel is flat then careful attention must be made in honing as the face has to be kept flat. Doing it by hand is essential that the angle is maintained and the chisel is dragged along the the paper grit away from the cutting edge. Starting with the course grit and using all the grit papers ending with finest to end with to obtain a flat mirror finish. Check the cutting edge to determine if there is a bur on it,to remove it put the flat back of the chisel unto the fine grit paper and drag it away from the cutting edge and the again onto the bevel face. Repeat until no bur can be felt, the chisel is now ready for use, a lot of users go one step more bur honing the chisel onto a piece of leather to get a super fine edge. To show that putting the heel of the taper onto the grinding surface first then tip the chisel up until the taper is in complete contact with it. A piece of leather glued to a wooden block to strop the chisel for a very sharp cutting edge. The normal angle of the taper set by the manufacturer is 25 degrees. 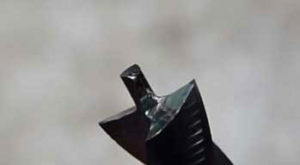 Should you prefer an angle of say 28-30 degrees it is not necessary to grind the complete taper. Set the chisel at the angle required and using just the fine grind paper and drag the chisel 3 or 4 times along the it. Using this method when the chisel dulls it will only be necessary to repeat this action to revive the cutting edge. A very good Video on Youtube by Paul Seller using the paper grit method. 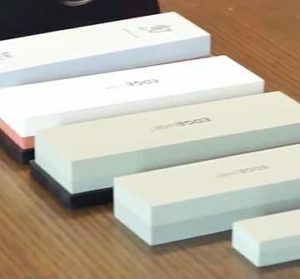 Before starting any sharpening actions of the chisel on the whetstone it is necessary to ensure that if using an oil or water stone that the surface is flat. Do this by passing the surface of stone over either a wet and dry paper grit fixed to flat surface or over a diamond stone. 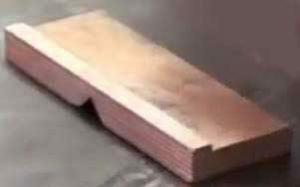 To check that the stone is flat draw across and down the length of the stone with a pencil and when all the marks are removed the stone is flat. Lubricate the stone with plenty of water or oil depending on the type of stone being used, All the time the grinding is being used. To flatten the back of the chisel place it on the stone so the the cutting edge is last to touch the stone and the reverse procedure when removing the chisel from the stone. This is to ensure that the cutting edge is not accidentally damage. Move the chisel up and down the length of the stone pressing on the back of the chisel with your fingers. After some strokes check the back of the chisel to ascertain the area being ground. It is not necessary to grind the complete length of the chisel but at least an inch or two from the cutting edge and from side to side. Turn the chisel round to work on the other length of the stone to keep the wear even across it. When the desired area is obtained change to the finest grit stone to achieve a good mirror type polish. It is desirable to obtain a good finish as this process will not have to be done again for a very long time. To determine the bevel onto stone put the heel of the bevel onto the stone and rock it slowly forward. 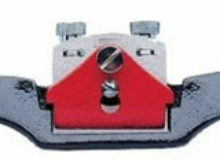 Having established the position for grinding move the chisel along the length of the stone. Check the state of the taper, ensure to remove the chisel in the reverse way it was on to the stone. 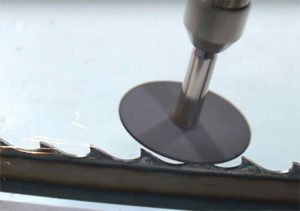 Having obtained a good surface on the taper change to a fine stone to obtain a mirror finish. Check the cutting edge for a burr that can be produced, to remove put the flat side of the chisel on the stone and carefully move it forward. This should remove it, if still a small bur remains first put the taper on the stone and make a small one and then again with the back of the chisel. Using a honing jig takes the uncertainty out of grinding the taper on a chisel and gives repeatable results. The chisel is clamped into the honing jig with a set amount protruding out of it. 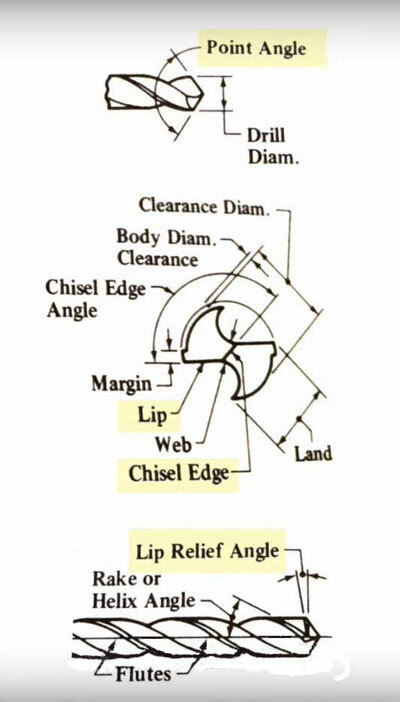 The amount determines the angle of the taper and so is very useful if a different angle is required other than the one on the chisel, for a special purpose. Having set up the jig all that remains to do is move the chisel jeg set up up and down the stone until the taper surface has the grind required. Then wipe clean the chisel and repeat the action on the finer grit stone, when the taper surface has a mirror finish remove any bur from the back face of the chisel. Reset the jig to grind a micro bevel a few degrees higher and grind on the finest grit stone with 3-5 grind passes. Remove the chisel from the jig and remove any bur that might occur. If a further stropping on leather this is performed free hand, to give the chisel the finest edge required. Before any grinding procedure ensure that the grinding wheel is free of embedded material from previous use and flat across the face of it. When dressing a wheel be aware the dust from it is hazardous to health and the use of a face mask is advisable. Freehand grinding is the preferred method for a quick grind but is an acquired action to get it correct. The roughing gouge require to be ground at an angle of 40 degrees and has to be right angles to the wheel. Using the tool rest supplied with the bench grind stone rest the tool on it on the flute, gentle move the tool to the wheel at the angle required. Do this first with the grinder stationary and use a marker pen to blacken the area to be ground, then rotate the wheel by hand to see the mark made. 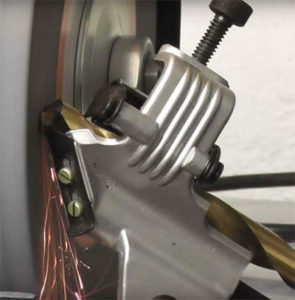 If the wheel has scored across the pen mark the angle set is correct, if not it will give an indication the direction the tool has to be moved. Having found the required angle start the grinder and do a light grind pass, do not exert too much pressure as the tool could heat up and burn the cutting edge which will make it useless for cutting. Bowl gouge angles with 2 examples:Swept back grind. 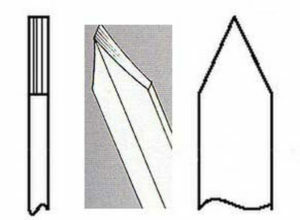 The Spindle gouge is a combine angled chisel and so requires more attention to the grinding. The cutting angle is relative stable, but the angle can be ground at a sharper angle for more delicate work. Then having ground this it is them necessary to grind a relief angle to be able to work inside bowls without fouling the spindle gouge. This relief grinding is done without affecting the primary cutting edge but will allow cutting to be undertaken with this ground area. The Skew chisel is a very useful tool with many varied operations and so many wood-turners shy away from it. Scrapers are relatively easy to sharpen they only need an angle between 70 and 80 degrees and the any bur on the top should not be honed off as this forms the major part of the cutting surface. 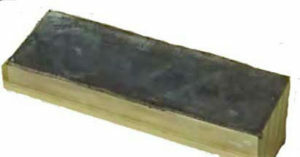 There is not a definite shape of scraping edge as the scraper can be shaped to the needs of the wood shape. The parting tool can be in various thicknesses and widths. 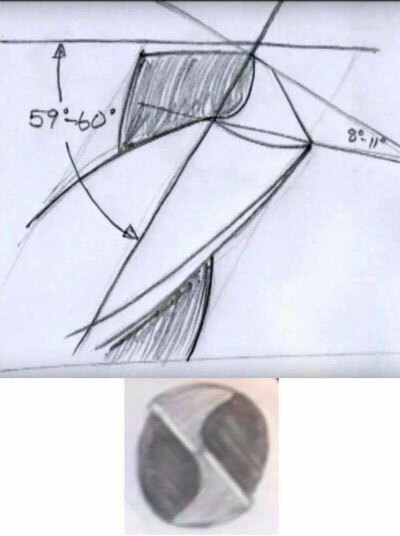 The drawing below is a very typical shape and the angle is proximately 25 degrees. As shown the tapers are hollow ground, the tip is honed to remove any burs. 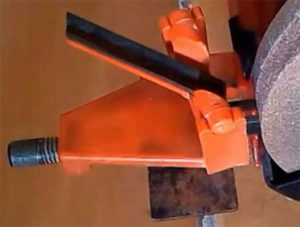 This is the set-up for grinding a gouge chisel, the distance is set with the grind wheel stationary, to find the angle on the tool that is required. A usual way is to use a maker pen and blacken the bevel, put the chisel in position and turn the grind wheel by hand. This will indicate where the wheel will grind and so adjustment can be made to get the angle required. When it is correct start the grinder and gently lower the chisel onto the wheel starting the grind at the left or right flute and rotate the chisel to the other flute in a gentle smooth action. When the sparks are coming over the tip of the cutting edge that will show the chisel is sharpened. If for any reason a lot of metal has to be remove keep the chisel cool by dipping it into cold water often. 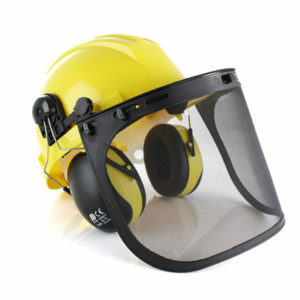 Take care and be sure to wear safety glasses or goggles. The jig is a part of the Wolverine Jig system. Alternative method using platform attachment. Set the platform at the required angle, checking in the same method as above with the marker pen. 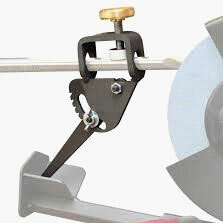 The gouge has to be kept in contact with the platform and the chisel at right angles to the surface of the wheel. 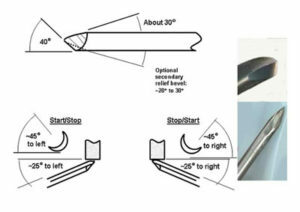 The rotation of the chisel from flute to flute needs to be a smooth action, more attention is needed with this method. The same attention as above regarding safety and heating of grinding action. The following is an attachment to grind sweeps. This and other home made attachments allow the tool to be rotated from side to side allowing a sweep grind to be made. 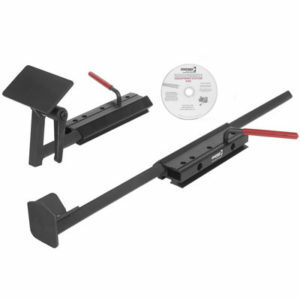 The platform attachment is a very useful tool for grinding a variety of chisels such as Parting, Skew and Scraper. All that is needed is to set the Platform at the angle required and apply the tool flat on the platform and set to any offset angle to the grinder that is needed required, ie skew chisel. 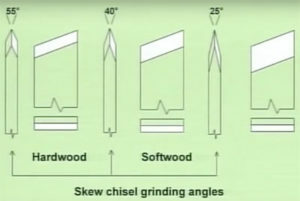 The angles and profile of a standard twist drill. It is essential to keep the two cutting edges are kept equal as to ensure the point of the drill is central. This is to ensure that the hole that is made is the the size of the drill and not over-sized. 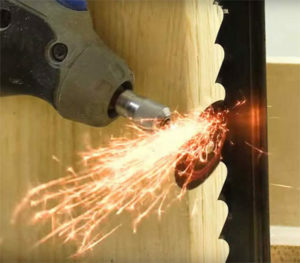 If a drill isn’t sharp it certainly wont cut efficiently. Trying to force it to will generate excessive heat and eventually make the drill unusable. The drill needs to be presented to the grinding wheel at 59o. To give a guide set the protractor at 59o lay it on the tool rest and mark the tool rest with a marker pen. Hold the drill near the tip of the drill with the thumb and forefinger of the right hand and the shank with the left hand. Wearing safety glasses, present the drill to the grind stone. With the forefinger resting on the tool rest, just above the centre of rotation. The cutting edge parallel with the centre of rotation of the grinding wheel. Then gently allow the drill into contact with the wheel. Then lower the left hand still keeping contact with the wheel so the the drill rides up the wheel. Not too far, this is so the cutting edge of the drill has some clearance to prevent it rubbing when drilling. Check with the protractor the angle and if it is not exact make any necessary adjustments to achieve the correct angle. Turn the chisel and grind the other cutting edge, then check the angle and this time measure each length of the cutting edge. They need to be the same so the the point is in the centre if required grind the shorter of the cutting edge to make then equal. 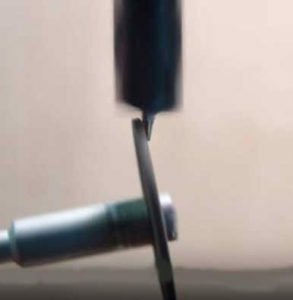 On large diameter drills it is advisable to grind a secondary clearance relief to ensure there is sufficient clearance to prevent any possible rubbing contact when drilling. There are many jigs, fixtures and special machines for sharpening drills but unless you have a vast amount of drills it is not cost effective to purchase the top end of the range. 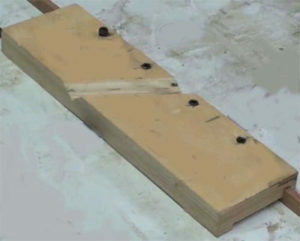 There are some simple home made jigs that can be made with little cash outlay. 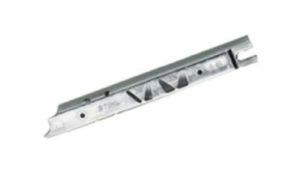 The pictures above are home made for assisting sharpening by grinding, there is a rebate on the underside to allow the fixture to slide parallel to the grindstone. 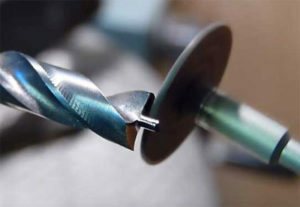 The angle of the ‘V’ groove is cut to give the correct angle of the twist drill. The first photo is a “Craftsman Drill Grinding Attachment” it gives very good results but it uses the side face of the grinding wheel which is not recommended by wheel manufactures. The Drill Doctor was bought by the tester second hand and on test found to be not easy to set up and use and gave poor results. 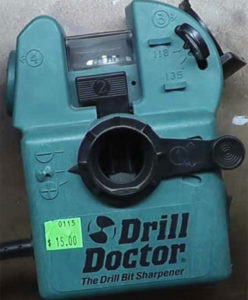 The above description of the drill doctor was unfair as it wasn’t a true valuation of the products potential. 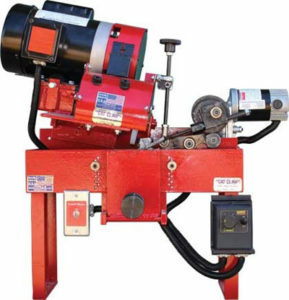 Having then found a site “Drill Doctor 750X review” and found that it did perform well and had many features that were no possible in the second hand machine as it didn’t have all the attachments. 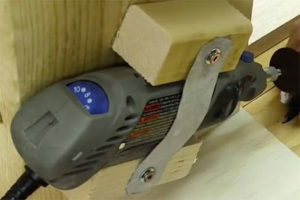 This home made vertical belt sander adapting a hand sander and still having the use of hand sander if required. Dual purpose use of sanding too. 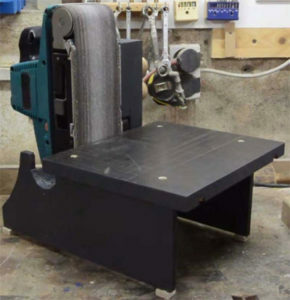 The Craftsman drill jig could be adapted to be used on a belt sander so avoiding the use of the side of a grinding wheel. 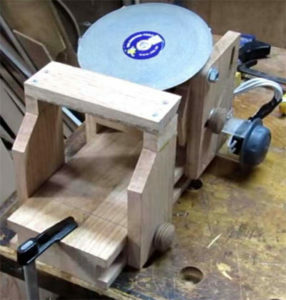 This is a home made disk grinder would also be a possible machine to use the Craftsman Drill Grinding Attachment as well as sharpening a great many woodworking tools. The extra benefit of the these two machines it that very little dust is produced and the grinding surface does not have to be dressed. 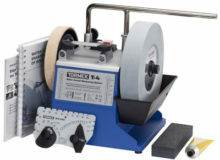 To purchase the Tormek grinding system just to sharpen drills would be a very expensive drill sharpening equipment. 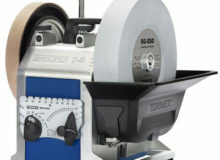 If the machine was purchase as an overall sharpening system for all your woodworking tools it is a very good investment. The wheel is water cooled and slow running so has the many advantages over the standard bench grinder. No sparks, dust and grinding continuously with the danger of overheating the tool being ground. The drill grinding attachment is easy to fit and gives a precision 4-facet sharpened point eliminating some of the problems associated with the normal chisel point. 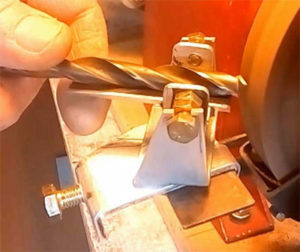 They can be made from standard twist drills, that are no longer required or even broken and in the process that follows can be used to sharpen Brad-point bits. The first thing to be undertaken is to grind the drill to produce the cut-away leaving sufficient metal to produce the point. 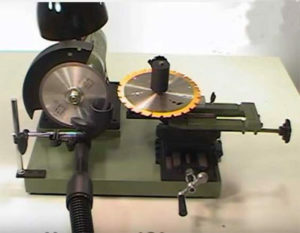 The twist drill is put into a drill press and set up a Dremel or similar drill with a small grinding disk setup. The result is the photograph below. Having produced the basic shape now to get the cutting edge. Using the Dremel by hand grind the back rakes avoiding the spigot for the point and grinding away any of the cutting edge. This can also be a method of sharpening a Brad-point drill. All that is left to do is to establish the point. This is done by putting the drill back into the drill press and grind the point using the Dremel in hand with the drill press rotating. 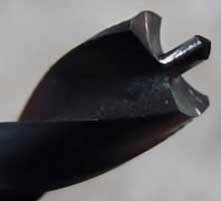 Examples of spade bits: Providing they are not hardened drill bits they can either be sharpened on a grind wheel or with a metal working file. 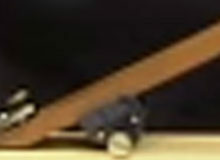 With a grind wheel the platform is set at a suitable angle. Then lay the drill bit on the platform using the right hand side of the wheel gently grind the drill bit. If it is being sharpened for the first time it will have pointed spurs so this means they will be ground away but they will still cut. Turn the drill bit over and grind the other side, if necessary touch up the point. Should the outer side of the drill are dull they can be touch up gently to ensure a clean hole id produced. Do not remove too much metal or the hole size will cut small. 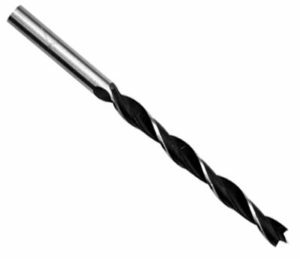 To sharpen with a file, clamp the drill bit low in a vice so that when filing the bit doesn’t vibrate. File the cutting edges maintaining the cutting angle. Finally touch up the point be careful not to touch the cutting edge. Remove any burs produced by filing. There are 2 configurations of saw teeth angles, the Rip saw is sharpened at 90o and a Crosscut Saw is sharpened between 75o-80o . Each tooth is offset a small amount so that the saw cut is bigger than the saw blade to prevent binding and allow an easy cutting action. Cut slots across 2 off-cuts of 4 x 2, one slot at 90o and the other at 75o-80o about 1/4 inch deep. These to be used as a guide when filing the teeth. Clamp the saw between 2 lengths of wood so that the teeth of the saw are clear of the wood about a 1/3 inch. Mark along the top of the teeth with a black felt tipped marker pen, this will show which teeth have been sharpened when the black marks have been removed by the file. 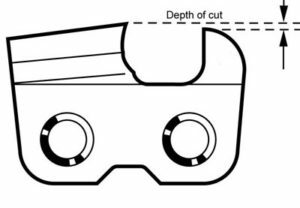 Put one of the 2 off-cuts, depending on the type of saw to be sharpened on to the saw to give a guide to the angle of the file. Sharpening a Rip-saw file every other tooth then turn the saw round and file the teeth not sharpened, if a cross-cut saw file every tooth. Should this be the first time the saw needs sharpening then this is all that will be require to bring the saw cutting action back. However if the teeth are worn away and not level then it will need to use a flat mill file to level the teeth, it is essential that the file is kept at right angle to the saw blade. 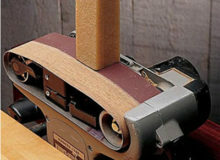 If in doubt it is possible to purchase a Saw Jointer, this clamps the file and has a lip that slides along the face of the saw and keep the file in the correct position. Then re-sharpening will take some more time and attention, each filing action will take off more metal from some of the teeth. The action continues until each tooth has come to a point and no flats remain generated by the flat mill file. Having made all the teeth level and sharp they now require to be set with a Saw Setting tool. 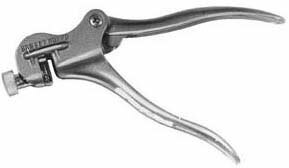 The tool is relatively easy to use it has an anvil which is set to the size of the teeth and then placed over the tooth to be set and the plier action is closed and a plunger pushes on the tooth and bends it slightly. The amount of bend is determined by the set on the anvil, continue along the saw bending every other tooth. Then go along the other side of the saw blade setting the teeth that have not been set, this action produces a cut that is wider than the saw blade. 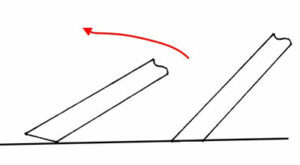 To determine the size of the correct file the distance between 3 consecutive rivets along the chain and is divided by 2. If the result of the measurement is 3/8 inch pitch then a 7/32 inch diameter file is used. If it is .325 inch pitch then a 3/16 inch diameter file is used..
Lightly clamp the chainsaw bar in a vice and check the condition of the chain. Advisable to wear protective gloves. Mark the first cutter to be sharpened and put engage the chain lock. Filing by hand without the use guides can be done care is needed to maintain the angle of the file. This varies between 250 to 300, refer to the manufacturers handbook. The file must be proud of the top of the tooth by about a 1/4 of its diameter. 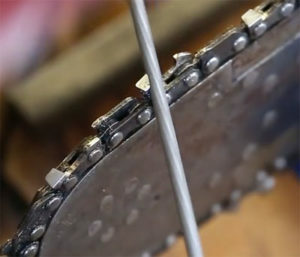 After sharpening 2 teeth unlock the chain and move it to expose more cutting blades. 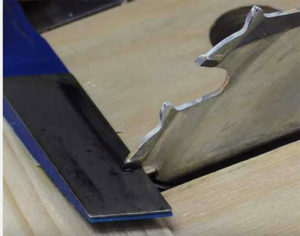 When filing file from the back of the cutting blade using 2 or 3 strokes or as many as require to get a point to the top of the blade and sharp cutting edge to the cutting blade. Files only cut on the forward stroke, do not put pressure on the back stroke so maintain a good life of the file, also occasionally rotate the file. 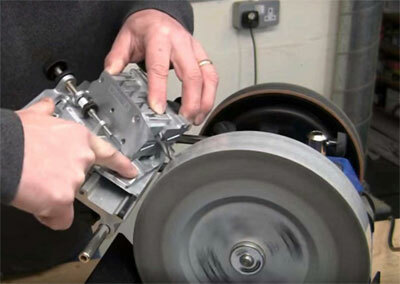 The are a good many filing jigs as an aid to ensure that the file is held at the correct angle. The above procedure applies just the same but minimizes any sharpening errors. Having sharpened the cutting blades the next item to check is the depth of cut, this is obtained with the use of another jig. 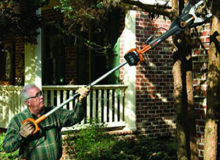 The Powersharp attachment requires some changes to be made to the chainsaw. The complete kit including the attachment can be purchased for various models of chainsaw. Once assembled the sharpening process is simple and quick,but there is no indication as to how many times the chain can be sharpened before the chain needs replacing. 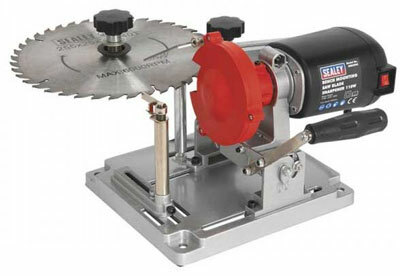 Circular saws present some difficulties in respect of their shape, size and design. 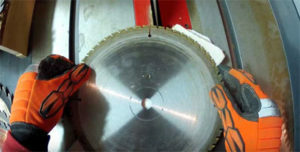 The modern saws are mainly carbide tipped and care must be taken when using grinding disks not inhaling the carbide dust and to wear protective goggles and gloves. One very simple method is to affix with double sided adhesive tape diamond sharpening sticks to a length of wood cut about 200 angle. This arrangement is then set under a tooth of the saw whilst still in the Circular saw machine. Holding the saw blade against the diamond sharpening stick move it too and fro at right angles to the blade and lubricate the stick. Continue this to each tooth of the blade until all have been ground. Clean off the lubrication from the diamond sticks and the saw disk. Your saw table is now ready for use. This form of tool resharpening is only possible when the tooth is at right angles to the circular saw blade. 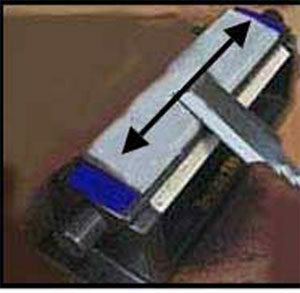 The photo is showing another sharpening method. A diamond disk is put in place of the Circular saw and is used to grind the teeth of the circular saw. 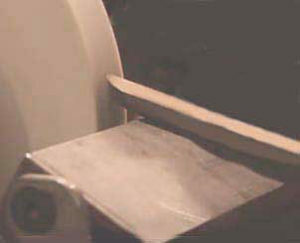 A packing piece is placed under the saw blade to prevent any damage to the saw table. This method requires a steady hand and the need for protective gear is paramount, be aware of any carbide dust which is harmful. 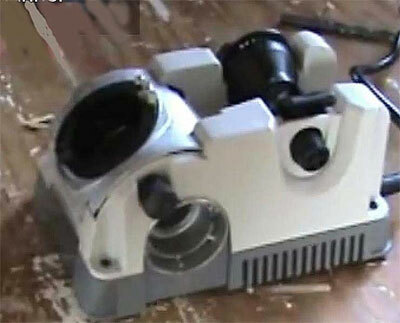 The is a photo of a circular saw blade sharpening machine, it is a cheap Chinese copy. The presenter in the following video gives a very good presentation of the shortcomings of the equipment. 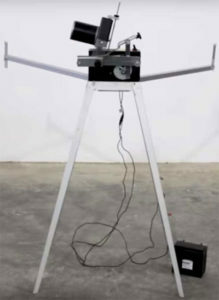 This machine is of much better quality, the video does not have any spoken commentary so there is no explanation of how the presenter makes the various adjustments. There is a vacuum point take off at the point of grinding so eliminating the possibility of contaminating the operator. The only down-point is there is no sprung loaded ratchet to locate the tooth to be ground, so it is left to the operator to judge how much metal is removed. This in time can make the teeth of the blade uneven. The good quality is also reflected in the higher cost compared with the previous machine. 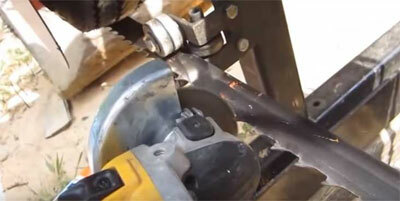 There are several methods to sharpen band saws each one gets good results. In the photo the operator is just using a bench top grinder without guards. It can be see limitations on pitch of the teeth to be able to be ground. 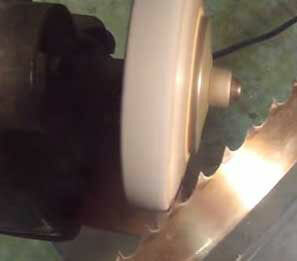 The following method is a completely different approach to sharpen a bandsaw. It uses a Dremel tool with a disk grinding accessory to grind the top of the teeth. The benefit of this method is that the operator sits down to do this operation. The disadvantages are that this method of sharpening has a limited number of times it can be done. There is no grinding taken place in the gullet of the band saw to eliminate possible cracking of the band saw. This set up is done on site and uses an angle grinder. Using this method requires some skill in operating the grinder. But it can be done fairly quickly where down time for the operation is kept to a minimum. I think that this can only be done with large pitch blades and not suitable for the hobbyists. This set up was a quickly made but is very effective as it can be used with band saw blade still in place in the band saw machine. This appears to be a very good benefit if the resulting sharpening is successful and it transpired the results were very good. The only disadvantage is that no possibility to clean up the gullet to minimise the effect of cracking due to the flexing of the band when curving over the driving wheels. The sharpener is battery operated which makes this machine very portable. It runs off a 12 volt car battery and will be able to continual working for a whole day on a fully charged battery. The grinding action is completely automatic so once set up and running releases the operative for other duties. 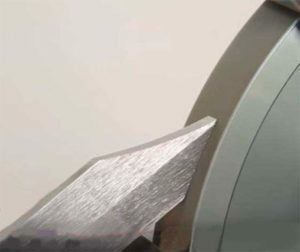 A bracket is fitted to the blade at the start position which stop the machine when the blade has completed its full sharpening cycle. 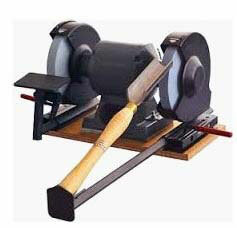 This is one of the top of the range of for sharpening blades up to 4” automatically. It is fully adjustable for aspects of blade grinding including the gullet. All adjustments are shake-proof so once set hey will not alter during operation. This machine is expensive so possibly not for the hobbyist as it is designed for fairly constant use on a commercial basis.